This past weekend was an amazing experience for me and my family. 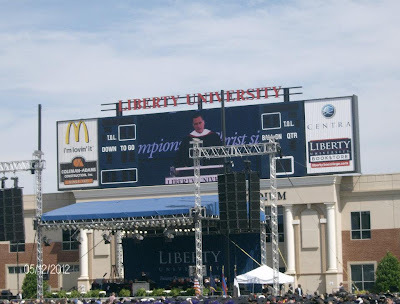 If you are connected to me via Twitter or Facebook you are already aware that we traveled to Lynchburg VA to participate in Commencement exercises for the graduating class of 2012. 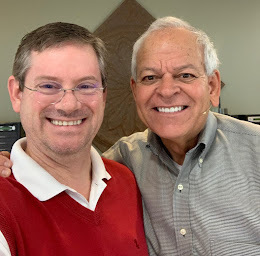 Though I have a couple of classes I am taking this summer, I am approaching the end of a 3 ½ year journey in obtaining the Master of Religious Education from Liberty Baptist Theological Seminary. This would not have been possible without the constant support and encouragement of my wife Melisa. Many of you are aware that Mitt Romney was the key note speaker on Saturday and let me tell you, having a presidential candidate present made for some interesting experiences I never thought I would have. For example, going through metal detectors and being individually screened by the Secret Service was certainly unexpected. 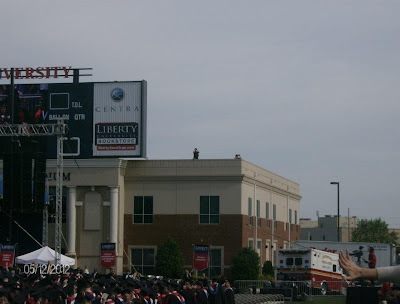 Snipers on the rooftops was also something else I never thought I would see at my own graduation. Then there were the “suits” everywhere! The entire experience was kind of surreal to say the least. I must say that in my interactions with the agents that I came in contact with, they were the epitome of professionalism. I would be remiss if I didn’t give some sort of recap of the remarks made by Gov. Romney during his address. He received robust applause for his statement on marriage being between one man and one woman brought the entire stadium to its feet. From my vantage point, the balance of his remarks was received with tepid applause. The crowd was respectful of Gov. Romney though many of the military (current active duty and former service men & women) I was seated with remained seated throughout Romney’s address with the previously noted exception. I have to say I respect Romney for clearly stating that his own religious views are decidedly different from those of Liberty University. It needed to be acknowledged by the governor himself. All in all, Romney’s remarks were more or less what I expected them to be. 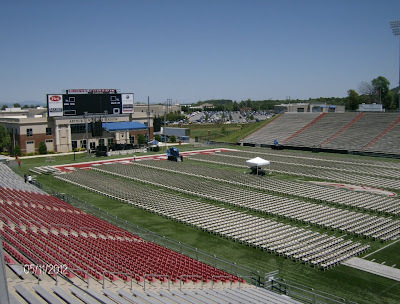 From the stadium, the graduates went to a separate ceremony for their respective schools within the university. 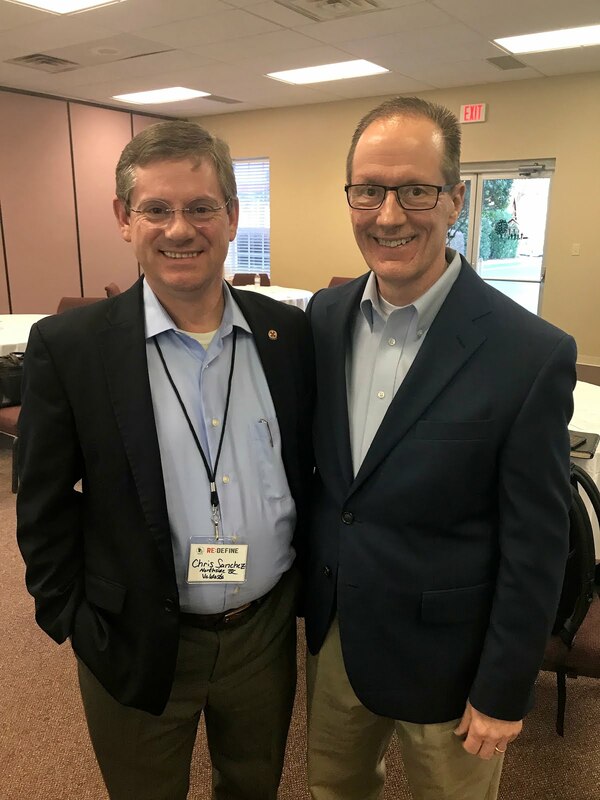 The School of Religion and LBTS went to Thomas Road Baptist Church for their respective honors. When the seminary graduates gathered, emotions were running high with anticipation. Meeting Dr. Elmer Towns was a thrill as was watching so many graduates cross the stage. When my own turn arrived, I was overwhelmed by the sense of the moment. My wife had been asking me if the events felt “real” yet. At that moment, everything most certainly did feel “real”. 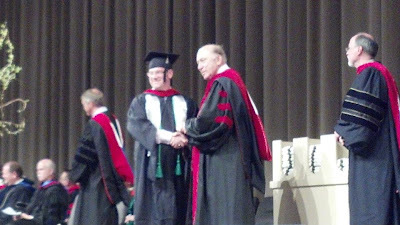 The highlight of the weekend occurred when Dr. Dan Mitchell called the graduates back to the stage which became our altar. 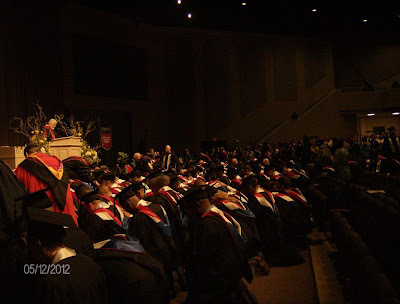 We were lead in prayer while the seminary faculty present lay hands on the graduates. 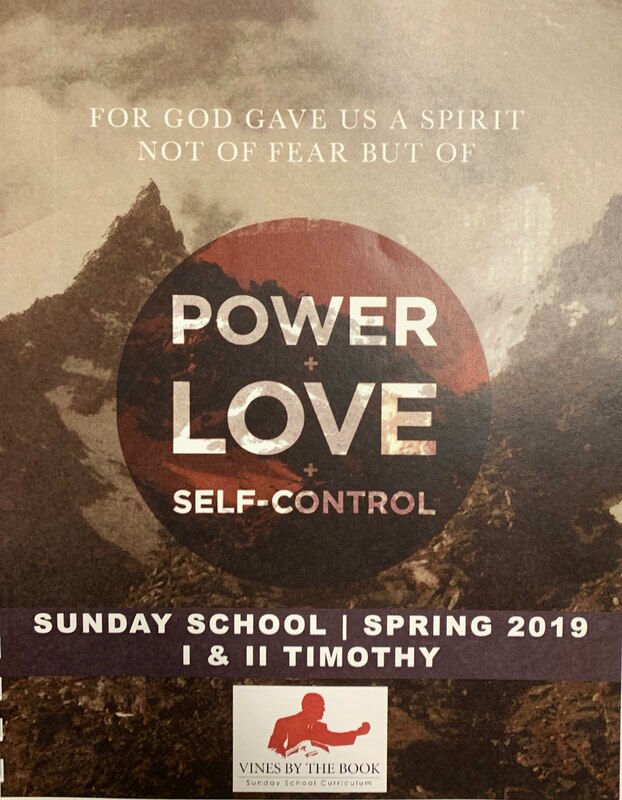 The presence of the Holy Spirit was unmistakable! When we concluded, I looked up to see it was Dr. Towns himself who had lay hands on me during our time of prayer. The entire experience was very humbling! 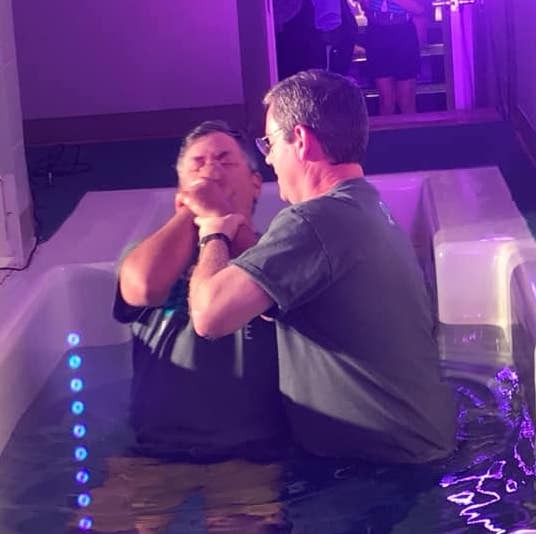 It was wonderful to be able to share this experience with my wife and children. The kids especially got a close up look at how a large school honors graduates. We were all especially impressed with the emphasis placed on recognizing the online students. Liberty is leading the way in the online delivery of education enabling thousands of people each year to achieve their educational goals. Perhaps one day the schools who have not yet recognized the value of offering their programs in an online or hybrid residency format will do so. Thanks for all of the support and congratulations from my family and friends! I think you all know this has been a labor of love. And the journey is not over just yet! There is a little more left to do to conclude this part. Then, who knows what lay ahead but there will certainly be more to come! I have been following your blog for some time. I was actually down on my knees somewhere next to you, but I did not know you were there that weekend. I definitely would have introduced myself. What a wonderful experience it was. Keep blogging and sharing Christ. Thanks for your kind words Brian. It helps to know there are people out there who actually read my blog and maybe even find it useful.